The 2009 Ford Fusion gets a new Hybrid version for the 2010 model year, if fuel economy is your top concern, and the other Fusion models will see improvements in safety and performance. Ford also markets the Fusion as the Mercury Milan, and since the Mercury is a slower seller, you may get a better deal on it from your salesperson. The 2009 Ford Fusion is a great choice for those who place their priorities on style and handling, but if interior space matters to you, look elsewhere. TheCarConnection.com's team of automotive experts researched all of the latest road tests of the 2009 Ford Fusion to bring you this definitive review of Ford's mid-size sedan. Editors at TheCarConnection.com have also driven the Ford Fusion for themselves in order to offer their expert opinions. The mid-size 2009 Ford Fusion sedan shares its basic architecture with the last-generation Mazda6, but the styling, both inside and out, and features lists are significantly different. The combination of upright, creased sheetmetal, the distinctive chrome front end, and the airy greenhouse with plenty of window space is, even several years after the Fusion’s debut, a refreshing departure from mid-size sedan styling convention. The Fusion is powered by a 221-horsepower, 3.0-liter V-6 or 160-hp, 2.3-liter four-cylinder engine. V-6 models of the 2009 Ford Fusion can be specified with either front- or all-wheel drive, while four-cylinders come only with front-wheel drive. However, the four comes with a standard five-speed manual gearbox, while automatic transmissions are featured on the rest of the line. The 2009 Ford Fusion surprises with its sporting intentions in terms of handling, a rarity in the family sedan market. The styling also holds an aggressive appeal, although many consumers will be disappointed with the Fusion's fuel economy compared to the competition. The other major disappointment is that the V-6 Fusion doesn't have a manual transmission or even a manual-shift option for the automatic. Inside, the 2009 Ford Focus has a pleasing design that dips a bit in execution. Materials quality can be hit-and-miss depending on the trim, though the driving position is nice and front seats are quite comfortable and supportive. Backseat space is a low point, with the Fusion ranking near the bottom of its class here (although it is a bit shorter than most rivals). The base four-cylinder S trim is quite spartan, but the rest of the Ford Fusion SE and SEL trims—in four- or six-cylinder models—come well-equipped. 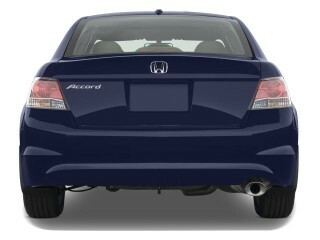 The options list includes a DVD-based navigation system, a moonroof, and an Audiophile eight-speaker sound system. Safety remains a mixed bag for the 2009 Ford Fusion. It’s achieved some very respectable ratings in crash tests, with almost top marks across the board, and both front side and full-length side-impact curtain airbags are standard, but electronic stability control is only offered as a $495 option—even on the top-of-the-line SEL. The 2009 Ford Fusion is more stylish than most in this category, and a few optional appearance packages can spruce up both the interior and exterior. The 2009 Ford Fusion wins favor among automotive experts in reviews read by TheCarConnection.com for its eye-catching blend of sharp edges and contoured surfaces. Unfortunately, those same reviewers didn't find much to love about the boring interior. The Ford Fusion "fits into the Ford car lineup between the compact Focus and the big Taurus sedan," according to reviewers at MyRide.com. 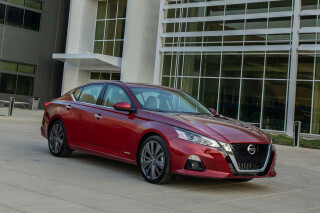 Cars.com states that prospective buyers will have "a choice of S, SE and SEL trim levels," although the exterior differences aren't significant. In a welcome change for Ford, the exterior of the Ford Fusion wins significant praise from reviewers; MyRide.com says that "some people, including us, like the aggressive, angular look of the Fusion, some don't. We'd like to note that polarizing designs are often more successful than bland designs that neither offend nor excite anyone." Automobile Magazine likes how the panels on the Ford Fusion come together in a way that is "clean and a bit more interesting" than most of the Fusion's competition. For 2009, Ford offers a couple ways to distinguish your Ford Fusion from the pack, as Cars.com notes the availability of "optional dual chrome exhaust tips (standard on SE V-6 and SEL V-6)," as well as an "optional sports appearance package: 18-inch alloy wheels, unique black chrome grill and rear-lip spoiler." Moving inside the well-received sheetmetal that adorns the 2009 Ford Fusion is a bit disappointing, as the interior styling fails to excite in the same way as the exterior. AutoWeek characterizes it as "the same boring and straightforward layout you can expect from Ford," while Cars.com notes that "certain elements are especially dated—most obviously the stereo system, which still sits in a square cutout." Other reviewers mention similar problems with the bland styling, but some positives do emerge from the interior of the Ford Fusion. 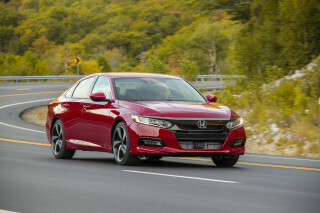 Foremost among them is "the simple layout of the buttons and the controls in [the] cabin," which Automobile Magazine says is "much better than a new Honda Accord" in that regard. ConsumerGuide also comments that "the gauges are easy to see and read." Ford Fusion owners who opt for the Blue Suede interior package will get a nice little boost inside the cabin, as AutoWeek points out that the "blue Alcantara seat and door panel inserts give the otherwise boring cabin a little flair." The 2009 Ford Fusion steers and handles better than most mid-size sedans. The 2009 Ford Fusion proves a surprising hit among reviewers for its handling prowess and compliant ride, but the overly thirsty engine options ultimately prove a disappointment. The available engines on the 2009 Ford Fusion aren't exactly deal breakers, but few reviews read by TheCarConnection.com rave about the Fusion's powerplants. ConsumerGuide says that "a 160-hp 2.3-liter 4-cylinder engine is standard, and a 221-hp 3.0-liter V-6 is available," although neither engine is sufficient to overcome the full brunt of the Fusion's curb weight. AutoWeek warns that the "160-hp inline-four will disappoint some," and ConsumerGuide affirms that by claiming those versions "are adequate, though they feel slower than our test car's 9.2-second 0-60-mph time would suggest." As for the V-6, Cars.com says it "feels comparatively less impressive," although it is "certainly stronger than the four-cylinder, and it moves quickest when revved hard," but it simply can't match the V-6s available in competing sedans. MyRide.com reports V-6 Ford Fusions "can accelerate from 0 to 60 mph in about 8.0 seconds," which they characterize as "reasonable performance." The 2009 Ford Fusion represents a big step forward for Ford in terms of transmission offerings, as all three of the Fusion's gearing setups prove successful. The four-cylinder versions of the 2009 Ford Fusion come standard with a five-speed manual, while a five-speed auto is optional, and V-6 versions come exclusively with a six-speed automatic. ConsumerGuide reviewers are pleased to find that "the manual transmission is pleasant to use," and AutoWeek praises the "nice-shifting five-speed manual transmission." The automatics fare well also, as MyRide.com remarks that "the six-speed automatic transmission is very smooth" and "it's one of the few six-speed automatics in this class." Unfortunately, several reviews read by TheCarConnection.com lament the fact that, as MyRide.com says, "it does not offer a semi-manual shifter." On the positive side, Car and Driver reports "it has the added benefit for people who live in the Snowbelt of being available with all-wheel drive," which is an option for the V-6 Ford Fusion. Despite the relatively low displacement of its engines, the 2009 Ford Fusion is not very frugal when it comes to downing gasoline. Cars.com calls fuel economy a "disappointment," noting that "among its major competitors, it's the only car that can't manage 30 mpg on the highway." The official EPA estimates for the 2009 Ford Fusion are 20 mpg city and 29 highway with the manual-transmission four-cylinder versions, while the five-speed auto returns 20 mpg city and 28 mpg on the highway. Front-wheel-drive V-6 versions should get 18 mpg city and 26 on the highway, and the all-wheel-drive models incur an expected penalty, returning just 17 mpg in the city and 25 on the highway. 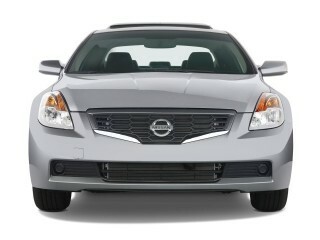 Ride and handling are definite pluses for the 2009 Ford Fusion, a welcome departure from the American sedan stereotype. AutoWeek says that, of all the Fusion's attributes, "the solidity of this car is the most impressive part." 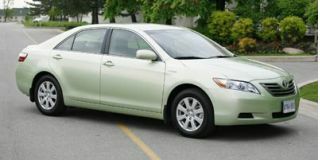 MyRide.com agrees, contending that the "ride quality is as good as any car in the class, save perhaps the Toyota Camry." The steering features "a light touch but stops short of feeling overly assisted," according to Cars.com, which adds that "the precise turn-in will impress anyone used to driving a family car." ConsumerGuide attests that, "in a straight line, all [Fusions] feel solid and well-planted," although unfortunately "a wide turning circle frustrates in close quarters." Comfortable seats and a roomy trunk make the 2009 Ford Fusion a practical choice for families. Reviews read by TheCarConnection.com are impressed by the amount of cargo space that Ford manages to cram into the 2009 Ford Fusion, which also sports a higher-than-average level of build quality. Materials aren't entirely up to par, but they’re still mostly pleasing to look at. The seating area in the Ford Fusion proves an area of contention among reviewers, with a very even split among those who approve and those who don't. One characteristic that's not debatable is that the Ford Fusion offers seating for five, although Cars.com says "no spot feels especially spacious." However, Edmunds raves that the seats are "well-shaped and supportive, even for taller folk." MyRide.com takes the latter opinion, stating that "the front seats manage to be slightly soft, yet supportive enough for long drives." They also approve of the rear seats, which they note feature "a decent amount of leg room with nicely shaped front seatbacks that allow for plenty of foot space," although MyRide.com points out that "head and leg room measurements don't put the Fusion at the top of its class." Despite the minor controversy brewing over passenger space, there's little disagreement when it comes to cargo room. Cars.com reports that "trunk capacity is 15.8 cubic feet, which bests the Fusion's competition." Edmunds adds that "an unexpected measure of utility is provided by the Fusion's 15.8-cubic-foot trunk," which Cars.com says is "easily one of the best you'll find in a family car." Interior storage isn't neglected either, with MyRide.com reviewers finding that the "convenient storage bin on top of the dashboard features a large clamshell lid and it's big enough to hold a phone or small camera as well as maps and the like." Overall quality proves to be a mixed bag, with fit and finish rated highly and materials somewhat less so. Edmunds reports that "although the upholstery is neatly tailored and build quality is above average, the interior's materials are hit or miss." However, Automobile Magazine points out this is still an "improved interior," one that features "Ford's new eight-inch navigation screen and the much-improved interface." Cars.com summarizes the interior feel by noting that the "wraparound dashboard is soft to the touch but finished in a grainy texture that looks inferior to some of the more common materials you'll find in this class." While not every review offers impressions of build quality, the high degree of fit and finish can be inferred from what reviewers have to say about cabin noise levels. ConsumerGuide is impressed in this regard, remarking that "wind rush is well controlled, but tire thrum is heard over grooves and coarse pavement." Edmunds has no reservations, claiming that "wind and road noise are muted at highway speeds." With the optional electronic stability control system, the 2009 Ford Fusion has been updated with accident-avoidance features to match its excellent protection. The 2009 Ford Fusion comes very close to a perfect score across both NHTSA and IIHS crash test ratings, but ends up falling just short in one NHTSA test. In the IIHS battery of tests, the 2009 Ford Fusion earns the highest possible rating, "good," in both the frontal offset and side impact tests. In the federal government's NHTSA tests, the Fusion earns a perfect five-star rating for both front impacts and side driver impacts, as well as a four-star rating for side rear impacts. In addition, the IIHS awards the Ford Fusion its Top Safety Pick rating for 2009, citing the Fusion's "good performance in front, side, and rear tests and optional electronic stability control." Many reviews read by TheCarConnection.com slammed the 2008 Ford Fusion for not offering a stability control feature, so for 2009 Ford has updated the Fusion with the latest safety gear. The caveat, note TheCarConnection.com’s editors, is that it’s a $495 option and many of the four-cylinder models are likely to arrive to the dealership without it, unless you special-order. 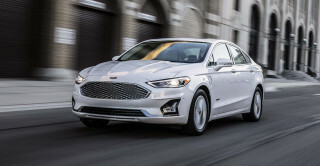 Cars.com states that the Fusion's "safety features include: standard side-impact and side curtain airbags, standard security system, standard four-wheel-disc antilock brakes, optional electronic stability system, [and] optional reverse sensing system." ConsumerGuide adds that "traction control" is offered on the 2009 Ford Fusion, while MyRide.com notes the presence of a "tire-pressure monitor [and] LATCH child-seat anchors." 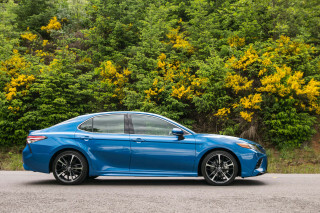 One complaint still arises, though; Edmunds reviewers opine that, while "stability control is optional on all Fusions this year...it should be noted that most top family sedans offer this important feature as standard equipment." 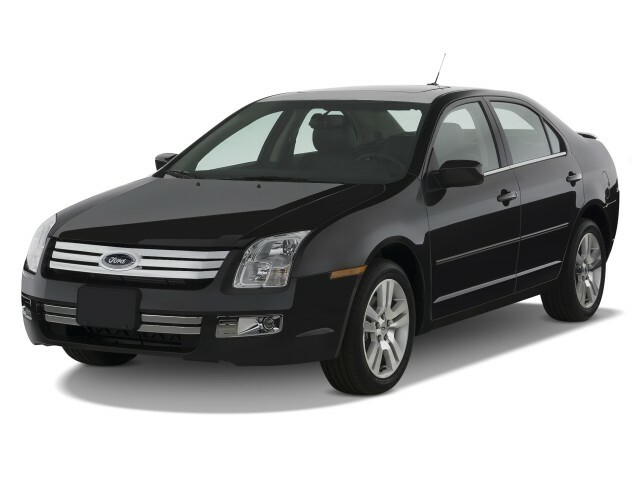 In addition to its wealth of safety features, the 2009 Ford Fusion offers tremendous driver visibility. This oft-overlooked component of driver safety is especially appreciated during lane changes, and ConsumerGuide notes that the "relatively high-set [seats] contribute to fine outward visibility" in all directions. The excellent Sync interface gives the 2009 Ford Fusion one up on the competition. In the highly competitive mid-size sedan market, available features can often provide a make-or-break moment in the purchasing process. Fortunately, Ford has some of the best high-tech features in the industry, positioning the 2009 Ford Fusion as a definite contender in this segment. Cars.com notes that "the Fusion S starts at just $18,010—some $2,000 less than the Accord or Malibu," and comes "impressively equipped at that, with power windows and locks, keyless entry, cruise control, A/C and a CD stereo." Moving up to the Ford Fusion SE, Edmunds states that you'll find "foglamps, six-way power driver seats, steering wheel radio controls, upgraded interior trim, a trip computer and a six-speaker stereo with an in-dash six-CD changer." Finally, the top-of-the-line Ford Fusion SEL comes standard with "automatic climate control, upgraded upholstery, multicolor ambient lighting...upgraded interior trim, a leather-wrapped steering wheel and the Sync entertainment and communications interface," according to Edmunds. While those extra features on the SEL might sound tempting, Cars.com is convinced that the "SE is the real steal" since it "costs just $925 more" than the base S.
Speaking of Sync, it's one of those features that reviewers were initially very apprehensive about. In reviews of the 2008 Fusion, some critics were quite vocal when mentioning their frustrations with the system. However, for 2009, most reviewers seem to be sold on what ConsumerGuide calls "Ford's Sync voice-activated interface for controlling cell phones and MP3 players." Edmunds says that, "impressively, your cell phone's address book is...wirelessly and automatically transferred to the vehicle," and in their testing, they've found that "Sync works very well, and judging by positive consumer feedback, it's definitely a major reason to consider the Fusion." The Sync system is optional on the Ford Fusion SE, but it's far from the only optional feature worth considering on the 2009 Ford Fusion. Cars.com states that "other options include heated leather seats, a moonroof, rear parking sensors, [and] a navigation system." MyRide.com also mentions the availability of a "Moon and Tune Package ($795) with a power moonroof and Audiophile stereo with six-disc CD changer and eight speakers." Car and Driver notes that "a DVD-based navigation system is an $1895 option, which is pricey considering that removable standalone units can be bought much cheaper, but it's not out of line with other factory-offered nav systems." Edmunds points out that "a touchscreen navigation" option is available on the SEL as well. Looking for a different year of the Ford Fusion?